Click the button below to add the GP012 (AAA 11mm Australian Golden South Sea Pearl Pendant and diamonds ) to your wish list. 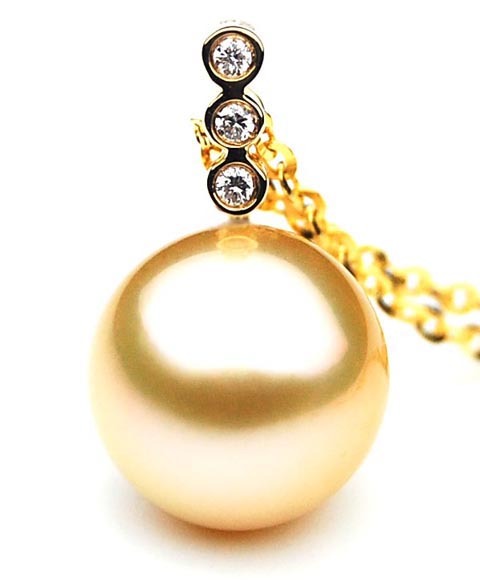 Perfect Round 10.8-11 mm AAA Quality Australian Golden South Sea Pearl Pendant set in 18k (750) Yellow Gold With 0.07 ct Brilliant Diamonds. Golden south sea pearl – Natural golden color, they are very beautiful and very expensive. They are the rarest . a golden natural present from pinctatda maxima oyster. Golden pearl produced by a particular type of large saltwater oyster – pinctatda maxima .They cultivated in the waters -Australia or Indonesia . There are two varieties of P. maxima: silver -lipped and gold lipped. The name are derived from the color of the shell interior’s outer edge. Both varieties exist in P.maxima’s south sea range. They are cultivated for long periods and have thick nacre , the oyster producing this type of pearl is much larger than the other pearl (eg. Akoya pearls , freshwater pearls) The oyster used are a wild species that is rare and the supply for cultivation is never certain, so why golden south sea pearls are so rare and expensive.